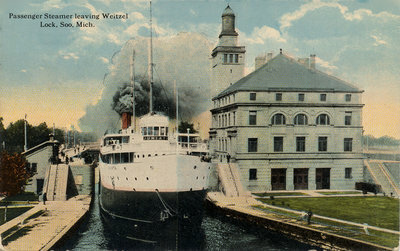 Passenger Steamer leaving Weitzel Lock, Soo, Mich.
Coloured postcard of the Erie & Western Transit Company (Anchor Line) steamboat JUNIATA in the Weitzel Lock at Sault Sainte Marie, MI. "Passenger Steamer leaving Weitzel Lock, Soo, Mich."
Reverse: "Passenger Steamer, Leaving Weitzel Lock, Soo, Mich. Used in connection with our post card No. 30, Passenger Steamer in Weitzel lock, Soo. Mich., this card will give an excellent idea of the workings of this lock. This boat, the palatial "Juniata" of the Anchor Line Fleet, is seen leaving the lock, on the Lake Huron level, after having been lowered eighteen feet. This view shows the power-houses of both locks."